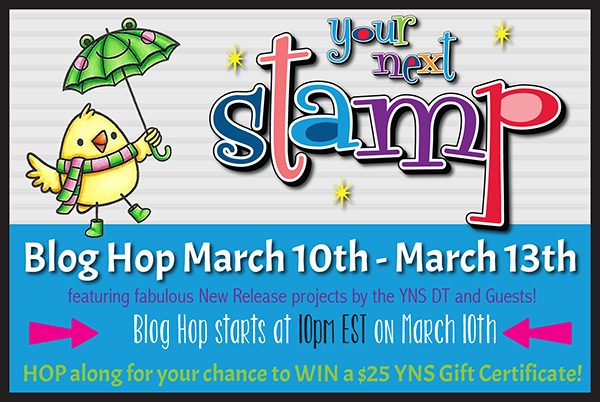 Hollybeary Creations : Your Next Stamp March Release Hop!! Your Next Stamp March Release Hop!! 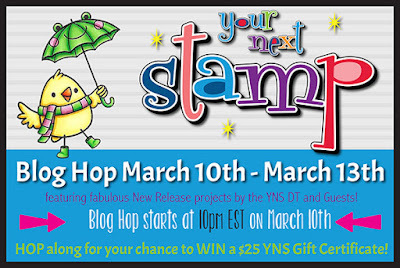 Yay... it's time for the Your Next Stamp March Release Blog Hop!! 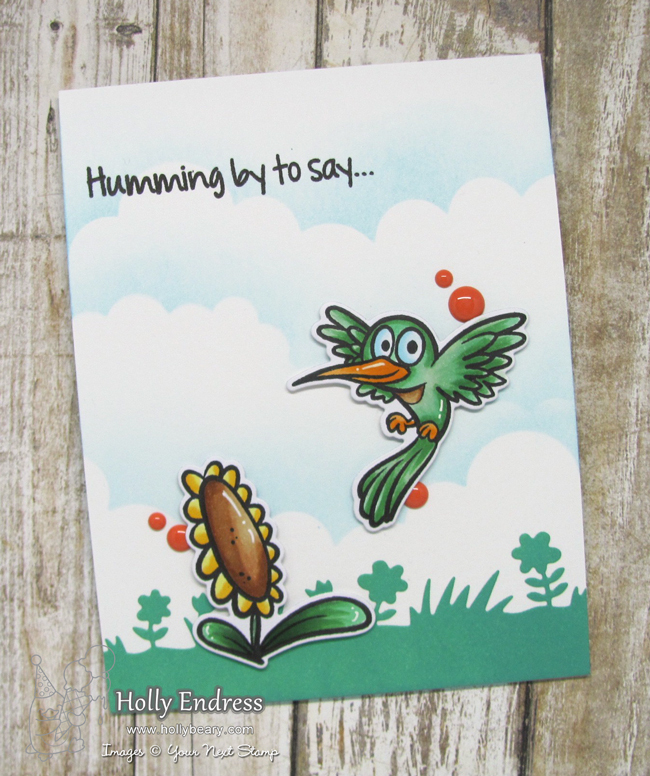 This months' released is filled with stamps and dies for Spring, Birthdays and more. Be sure to see all the details at the end of this post for info on the Hop. My first project features the new Humming By Stamp and Coordinating die and also some of the new Carrot Cake gumdrops. I created the cloud background by creating a stencil with the Puffy Cloud Border Die and some Tumbled Glass Distress ink. Then I added some Lucky Clover Distress Oxide ink to a piece of paper and die cut the Wild Flowers and Grass border die. I adhered the panel to a top folding card base and stamped the sentiment in the upper corner in Black ink. Then I stamped the images onto some X-Press it blending cardstock with the YNS Black Olive ink and colored them in with Copics. I used the coordinating dies to cut them out and adhered them to the card front with some foam adhesive. The images in this set are great to color with Copics and you can change the colors of the flower and the bird to just about any combo. 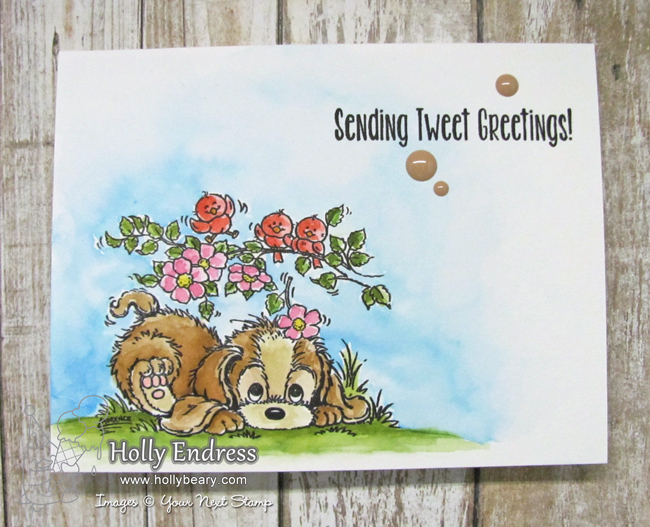 My second card features Blossom, this is an Adorable single image stamp set featuring a sentiment. I stamped the image onto some watercolor paper and colored it in with Distress Inks and an Aquabrush. Then I added the sentiment in the Upper color with the YNS Black Olive ink and adhered the panel to a A2 size card base. I added a few of the Carrot Cake gumdrops as well. This is such a sweet image, perfect for Hello cards. love both your bird cards! Such fun cards! Love your pretty coloring! Both your cards are fantastic the cute humming bird love. The puppy and his little birdie friend to cute!! Thank you for sharing. that little puppy is adorable! Oh, that hummingbird is precious! I love it!! What wonderful cards. Especially love the cute puppie. I love how you did the glowing backgrounds! So cute! Your two cards are adorable ! Love your coloring..very cute cards!!! I like the coloring of these cute scenes. Darling! Love that cute hummingbird! Love your great cards. That bird scene is so cute. love your cards - they are so different and so beautifully designed! Adorable ... lots of cute things in this release. Sweet cards with these adorable new stamps! Awww!!! Adorable and sweet cards!!! Wonderful cards! That hummingbird is so cute! Love your design with the puppy! Cuteness! Love the cute puppy and busy hummingbird! Cute! Love the cartoon feel of the Humming By set. This cards are really super cute! Beautiful cards, I love that humming bird!!!! These are two cute cards !